Loyola’s Online Graduate Program in Nursing is designed to help nurses who want to become family nurse practitioners, nursing managers, administrators, and health care executives to advance their careers. Loyola University New Orleans School of Nursing’s online graduate (Master’s and Doctoral) degree programs rank No. 39 in the nation among Best Online Graduate Nursing Programs, according to a new survey by U.S. News and World Report released Tuesday, Jan. 10. The programs also received special recognition as one of the nation’s Best Online Graduate Programs in Nursing sensitive to the needs of veterans. A complete list of the 2017 U.S. News and World Report Best Online Programs rankings, as well as methodology, can be found here. 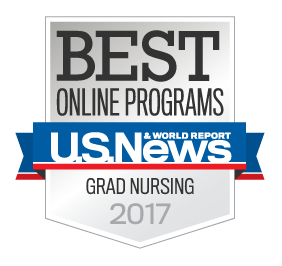 For the 2017 edition of the Best Online Graduate Nursing Programs, U.S. News ranked programs according to five categories: faculty credentials and training, student engagement, admissions selectivity, peer reputation, and student services and technology. Program scores were calculated using data the program reported to U.S. News in a statistical survey as well as date gathered from peer institutions. U.S. News sent statistical questionnaires to public, private, and for-profit institutions granting master’s and doctoral degrees in nursing that were accredited by either the Accreditation Commission for Education in Nursing or the Commission on Collegiate Nursing Education. The rankings considered 144 distance education programs for which all the required nonclinical coursework may be completed via distance education courses that incorporate internet-based learning technologies. Loyola’s top-ranked, nationally and regionally accredited online graduate nursing programs, moved to online format in 2004, have received numerous federal and state grants, and are designed to help nurses advance their careers through Jesuit-based graduate education that meets and exceeds guidelines and standards for nursing. Loyola’s acclaimed MSN degree program features three concentrations—Health Care Systems Management, Family Nurse Practitioner, and Nurse Educator—each with a unique curriculum designed for success in a rewarding career. The DNP Program includes a Post-Baccalaureate and Post Master track, with Post-Baccalaureate specifically targeting development of family nurse practitioners. In addition to its traditional entry MSN and DNP degree programs, Loyola’s School of Nursing offers a BSN to Doctor of Nursing Practice degree program, an RN to BSN degree program, and an RN to MSN Bridge program. The nursing school has graduated 2,561 students since the inception of the graduate programs in 1997.